Online learning has made a major impact in the world of education. In 2014, distance learning accounted for nearly three-quarters of enrollment increases in U.S. higher education. The University of Missouri College of Veterinary Medicine (CVM) is blazing a trail in this transformative enhancement of the educational experience. David Liss resides in California, but is able to work on a master’s degree in biomedical science with an emphasis in veterinary science through the MU CVM’s distance learning program. In fact, until recently, MU has been the only veterinary college offering a master’s program that can be completed entirely online. This year, the Florida University College of Veterinary Medicine began offering an online program that is limited to shelter medicine. “Ours is a master of biomedical science degree with an emphasis in veterinary sciences,” according to C.B. Chastain, DVM, MS, DACVIM, and an emeritus/adjunct professor in the Department of Veterinary Medicine and Surgery. “Candidates for our program would be veterinary technicians who have a bachelor’s degree and who want to work in academia, research, or veterinary medical industries: pharmaceuticals, surgical supplies and animal feeds. “The average veterinary technician will have an associate degree. Some choose to go on and get a bachelor’s degree; some of those aspire to a master’s degree,” Chastain said. “We can offer them a master’s degree that’s relevant to their field. It’s asynchronous, 100 percent online, so they can continue to work full time and do the coursework during their discretionary time. They can fit it in as best suits their schedule. For Stephanie Gilliam, who works at the MU Veterinary Health Center, geography was not the issue in advancing her education. However working full time and raising young children offered their own challenges to seeking a master’s degree. 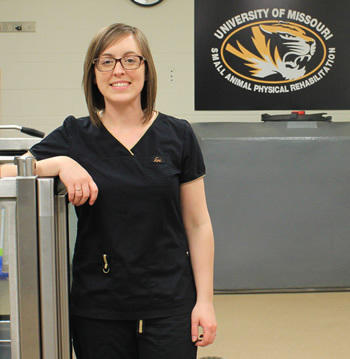 The MU CVM’s Veterinary Online Program allows her to pursue her studies on her own schedule. Students enrolled in online graduate training tend to be more mature and experienced, and frequently more motivated too. Many have already established a career and some, a family. Relocation is usually not an option, so they value the lack of geographic constraints that distance learning offers. The CVM’s online master’s program has a long reach. Chastain has had students from nearly every mainland state, Hawaii, and Guam in the Mariana Islands. Wallace has had a student who was deployed to Afghanistan. David Liss is currently earning his online master’s degree from MU while working in California. All exams are proctored. We contract with a company that uses a lockdown server and web cams to constantly monitor the exam process. The student must take the exam alone, in a quiet room, with no other materials present. If any crib notes are detected, or even other voices or noises, the exam is terminated; the student is locked out. It’s vital that we maintain academic integrity during testing. Liss, BA, RVT, VTS, CVPM, is board-certified in both emergency/critical care and small animal internal medicine. He has worked as a technician manager and emergency room/intensive care unit manager. He is a technician educator who lectures internationally and the author of numerous articles and book chapters. Liss has received some notable awards, including Veterinary Technician Educator of the Year from the Western Veterinary Conference and Southern California Technician of the Year. 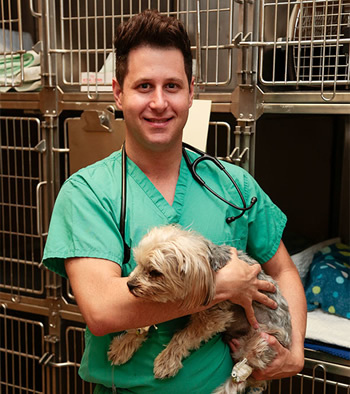 For nearly six years, he has served as director of a veterinary technology associate’s degree program in Los Angeles. “I stay clinically relevant by working relief as an ICU technician, but I work primarily as program director for the veterinary technology program at the Platt College School of Medical Sciences,” Liss said. “To advance to a dean position, or secure a better position in the private or public sector, I knew I would need a graduate degree. I also wanted to have formal academic training in research and publication. We use a template for our courses to ensure that our instructors are covering all the bases. We teach the instructors how to teach online. And, we put our courses through an external review to make sure they meet national standards for the quality of teaching. Stephanie Gilliam works at MU’s Veterinary Health Center (VHC) as a senior veterinary technician in neurology/neurosurgery and small animal physical rehabilitation. She also serves as an adjunct clinical instructor in the Department of Veterinary Medicine and Surgery. Gilliam, RVT, BS, CCRP, VTS (Neurology), was instrumental in developing the VHC’s Physical Rehabilitation Service. She has presented at national meetings for veterinary practitioners and technicians, receiving first-place honors in case presentations at the 2009 American College of Veterinary Internal Medicine forum. She was named a Service Champion by the MU Staff Advisory Council in 2014. Now, she is pursuing an online master’s degree with an emphasis in veterinary medicine and surgery at the CVM. “I love to teach,” Gilliam says. “I feel that a master’s degree will make me a better instructor and give me more opportunities for teaching veterinary students and technicians alike. Our method of online teaching has some other advantages for the student. They might watch the first video for 10 minutes, then go do something else, and then come back and watch the second video. That way, their attention is at peak level for both of those session components. Already working on the MU campus, location was not a deterrent for Gilliam. But, competing demands for her time presented an obstacle. For her, the online master’s degree program became the door upon which opportunity could knock. It’s a point that Chastain highlights. “With our program, you don’t have to stop everything you’re doing, or take time out of the middle of the day. If you are that motivated to advance your career, you can continue your full-time job and still get a master’s degree. You can maintain the critical parts of your family life. You can do this after you put the kids to bed,” he said. “But, Mizzou is the only place you can do it and earn a degree that’s relevant to veterinary medicine,” Chastain emphasized. Pursuing a graduate degree requires desire, determination, discipline, persistence and intellectual prowess. Even those traits may not be enough for an aspiring student with a profession, a family, or both. For them, the CVM’s online master’s degree program can open the door to a world of opportunities.